KAHULUI — Twenty-one businesses have asked the county to delay enforcement of the ban on foam containers until after they sell the last of their affected noodles, such as the popular Cup Noodles and Maruchan Instant Lunch. The county’s ban on polystyrene foam food service containers began Dec. 31. It prohibits businesses from selling or giving out products such as foam plates, takeout clamshells and coffee cups, and includes the foam cups of microwavable noodles. Up until two weeks before the ban, some county officials and many businesses believed the noodle cups were not included; an early form of the bill had exempted the items, said Tamara Farnsworth, the county’s Environmental Protection & Sustainability Division manager in the Department of Environmental Management. After a clarification from the corporation counsel’s office, Farnsworth said it was confirmed that the foam noodle cups were also banned. So two weeks before the law’s inception, the county informed the businesses. The county estimates around 2,000 businesses are affected by the new law, from gas station convenience stores and mom-and-pop shops, to the big boxes and chain grocery stores. “We are working with the businesses to allow them to exhaust their products,” Farnsworth said on Friday. But she added that the businesses seeking a delay in enforcement must contact her office. 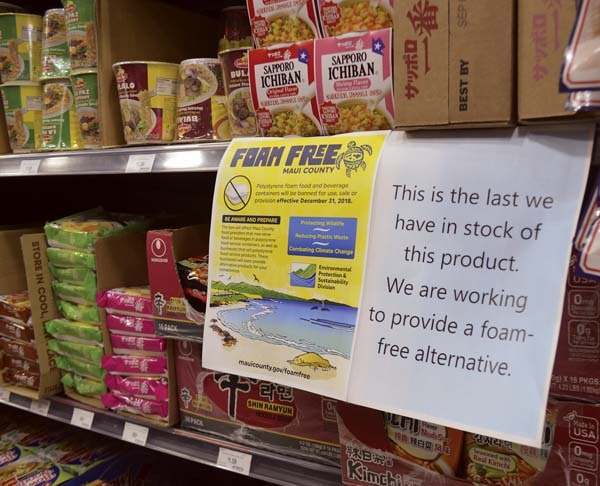 Businesses will be given signs to post near the products that let customers know that the products are the last in stock and that the business is seeking a foam-free alternative. 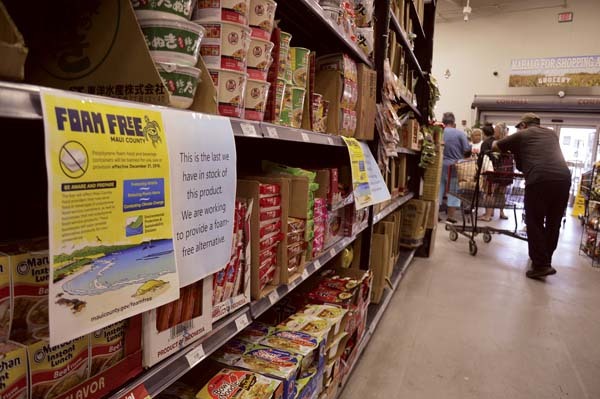 On Friday, the signs were up at Island Grocery Depot in Kahului on the instant noodle shelves. Owner Nelson Okumura said he was notified that noodle cups were also covered under the ban via an email from the Hawaii Food Industry Association. He initially thought those items were exempt. Okumura, who also owns wholesaler VIP Foodservice, said it has 10 weeks of inventory of Maruchan cups. 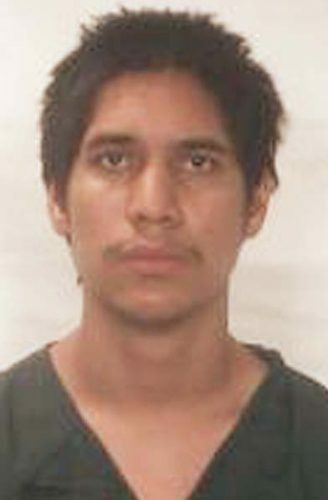 The county has given him until March 28 to dispose of wholesale stock. At TJ’s Warehouse in Wailuku, there are dozens of foam cup products that are now prohibited, said Joel Kawasaki, vice president of the family business. The business had time to run down its stock of foam plates and containers, but not cup noodles. Kawasaki has asked for time sell the products, he said. He added that the cup noodles are inexpensive; similar products that come in paper packaging cost more. “(But) I can probably count them on one hand or maybe two hands, there are a few paper type cups,” Kawasaki said. Sheryl Toda, a spokeswoman for the Sullivan Family of Companies, which includes Foodland and Sack N Save, said the company asked for six months to move through its inventory. Pukalani Superette fared a bit better, as General Manager Jerry Masaki said the store had maybe about 10 cases of noodle cups, which were sold to employees. So there was no need to ask the county for extra time to sell the backstock. But he is still wrestling with other portions of law, especially the foam trays he used for meat, sashimi and laulau. While raw meat is allowed on a foam tray, Masaki said sashimi and laulau are outlawed. “Lot of gray areas,” he said. The store will soon convert to a biodegradable tray and not carry foam. Masaki said it will be easier to handle the new law that way, without having to question what is allowed and what isn’t. The biodegradable trays cost a “couple of cents more,” Masaki said. He said the cost seems small, but adds up. Farnsworth said businesses have asked for from two to six months to rid their stock. If a business does not comply, it could receive a notice of violation that may require any of the following: ceasing and desisting the violation; correcting the violation before a specified date; paying a civil fine not to exceed $1,000 by a specified date or pay a civil fine of up to $1,000 per day for each day the violation persists. Years in the making, supporters of the law urged an end to the containers that do not degrade. Then-Mayor Alan Arakawa signed the measure into law on June 5, 2017, after the Maui County Council passed it unanimously. Overall, Farnsworth said, businesses are working to adapt to the new law. At one of her favorite restaurants, the owner was apprehensive about how the curry would hold up in anything less than a foam container, Farnsworth said. But the owner figured out that lining the container with foil would help it hold the sauce.